Arbitrary Mesh Interface (AMI) for non-conformal patches has been implemented based on the algorithm described in P. E. Farrell and J. R. Maddison, Comput. Methods Appl. Mech Engrg 200:89 (2011). AMI is a technique that allows simulation across disconnected, but adjacent, mesh domains. The domains can be stationary or move relative to one another. mapped patches, e.g. 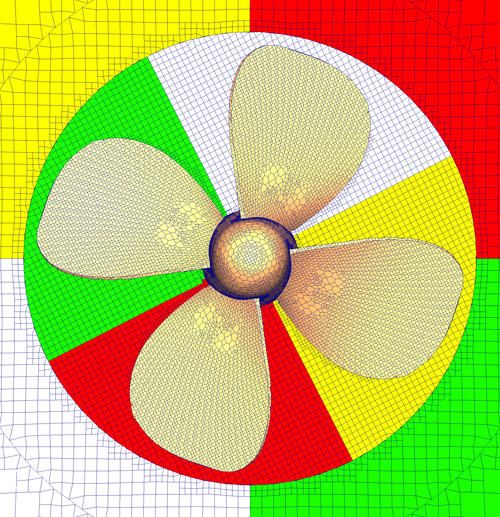 for coupling simulations between separate mesh regions, such as surface film and bulk flow. By default, AMI operates by projecting one of the patches’ geometry onto the other. However, it is also possible to project both patches to an intermediate surface, such as triangulated surface geometry or a continuous surface (defined by some function). The sliding interface capability has been tested on engineering geometries, including a propeller. The following image shows the mesh regions and their parallel decomposition, where the different colours indicate the processor indices. 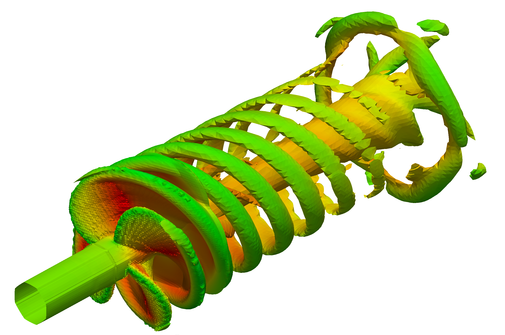 Flow was simulated using the pimpleDyMFoam solver. The following images show, respectively, the velocity magnitude and vorticity contours.